There is a Free Trial, which does allow you to publish a site. The cheapest subscription is Savvy, which is $21/3 months in the US app store. Other packages include Elite and Guru, and these offer progressively more features, storage, user management etc. Template selection is via desktop screenshots of a full-fledged demo websites, with text and images carefully laid out in beautiful designs. 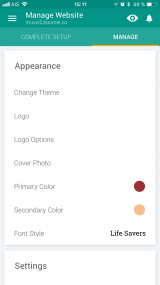 The content of the theme is customized according to the business category you selected in step 2. You can browse the mobile and desktop version of the demo website you have just selected. Note: From here, the only way to go back to step 3 is to uninstall the app and install it again. A valid phone number and an email address are required. Later on, if you need to connect from another device, Boomer will send you a SMS containing a one-time password. Boomer is database driven. Your content is classified into types, and each type of content is displayed on a specific page. The home page is built automatically from top items typed as "What's new", "Gallery", etc... with clever "View All" button to jump to the corresponding inner page. Building your own website is as simple as replacing the template pictures and texts with your own content. 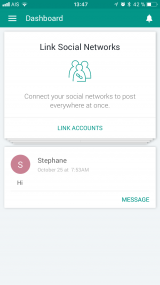 - Social networks: You can connect your Facebook or Twitter page so that your posts on Boomers appear also on your social networks. - Referral program: If you are on the Free Plan, you can get some Boomer extra features for free by promoting Boomer app within you community. - Voucher code: If you have such a code, you will get a promotion price on Boomer paying plans. Recent events, like chat messages sent from website visitors, online reviews... also appear on the dashboard. On the left-hand side, the "Complete Setup" invites you to add keywords metatags and a domain name to your website. The preview of each template is very clear and detailed. Logo: You can take or upload a picture for the logo that will appear on the top-left corner of each page. Logo option: Here you can select if you want to display your logo and/or business name. Cover photo: You can search (from Flickr or Pixabay), take or upload the pictures of the slideshow that will appear first on your home page. Note: The number of pictures is limited to 3 on the Free Plan. Primary Color & Secondary Color: You can select the 2 colors that are used for button, tabs... on your website. • Domain Settings: You can buy or map your own domain name to your website. 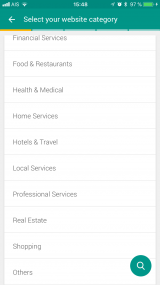 • SEO Tags: You can define a set of keyword metatags for your website. In this screen, you can read and answer chat messages sent from your website. In this screen, you can read the reviews written on your website. If you mark a review as testimonial, it will be displayed on your website, at the bottom of the home page. Note: To leave a review, a visitor needs to be logged in either on Google, Facebook or Boomer. In this screen, you can view and process the orders received from your online store. 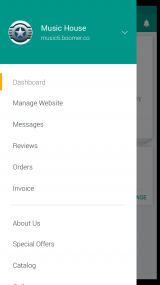 In this screen, you can prepare and send invoices to you customers (via your email app). In this screen, you define the text that will be displayed in the "About Us" section of your website, along with an image or YouTube video. In this screen, you can define the text and pictures, and parameters of great deals you want to promote on your website and social media. In this screen, you can describe your products (text + pictures), their prices and availabilites. In this screen, you can select the pictures to show on the gallery section of your website. In this screen, you can define posts (text + picture) about the latest news. In this screen, you can link your Facebook Profile, Facebook Page or Twitter account. In this screen, you can setup a payment gateway (PayPal or Stripe), buy or link a domain name, and join the Boomer user communities (associations). 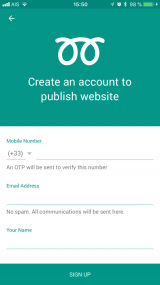 In this screen, you can give some permission to a person you trust, so that he/she can help you manage your website. Note: Managers are identified by their mobile phone numbers. 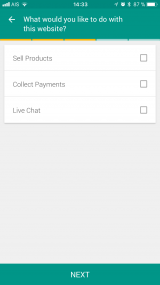 In this screen, you can change plan to access more features and bandwidth. In this screen, you can add a portrait photo to your profile and change your registered name or email address. - as a marketing specialist, you are enrolled in your website promotion activity and/or in Boomer app promotion activity (downstream process). This approach makes Boomer a one-of-a-kind app. 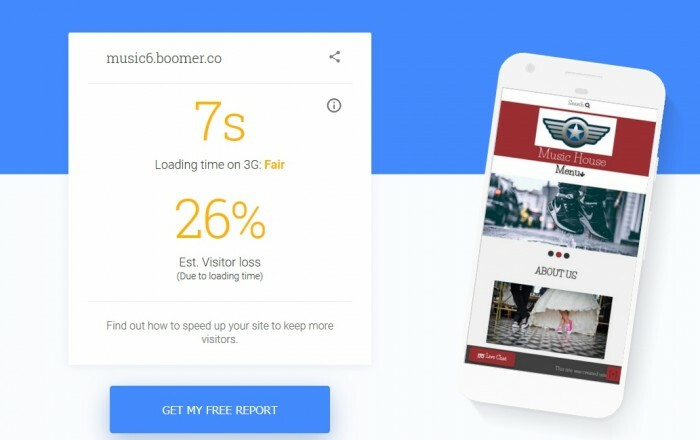 If you feel that you need a website for your business but do not want to learn anything about website creation process, Boomer is a good app to try out. On the other hand, if you already have a vision of what your website should look like, you will probably have a hard time building your website. If you have some experience with a major website builder, try to forget it before you start using Boomer app. If you have no experience, be ready to get confused. You will have to fill the system with data and then check the output website. Trial and error process (or reverse engineering of the templates) is the only way to learn how Boomer app works. 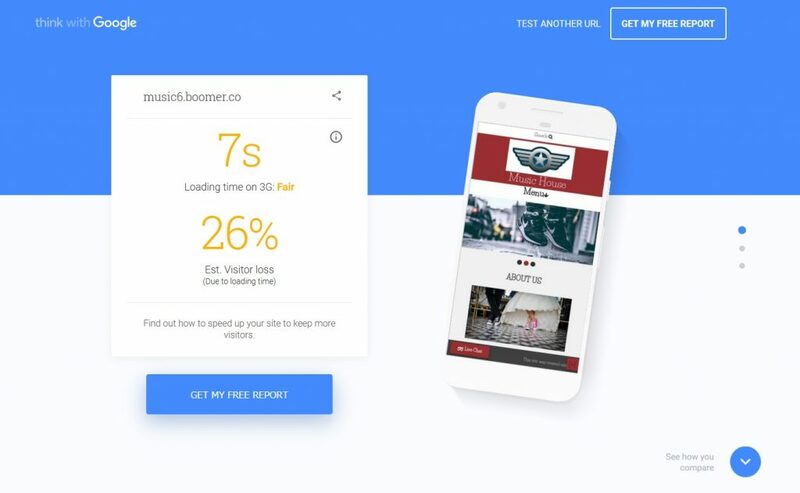 Boomer app provides a very integrated solution for an online retail business: product catalog of course, but also marketing, order and invoice management... and it is also available on Android devices. Once your website has been published, a historical line chart is displayed in the app dashboard so that you can track the number of visit at a glance. If you need more advanced statistics, you can enable the Google Analytics add-on. The "Complete setup" is a great idea to indicate the work progress. On the other hand, most of the dashboard focus on marketing your website (or Boomer app), even if you haven't build any website yet. If you need some support, you can write an email to Boomer support team (from the Your Account section). If you carefully study how the template you have chosen is built from the editor data, after a while you will find the app quite self explanatory. Anyway, replacing the template data in the forms with your own stuff is all what you can do. Boomer templates look great on mobile phones and on computers, and you can actually generate a site that is a replica of the template you chose. In the Manage Website section, there is even a handy Computer preview, so that you can feel how your website will look like on a computer. The published website (without the AMP option) is a bit sluggish to load. The website Think with Google reports a 7s loading time on 3G. In Thailand (where I am located), you should expect no less than a 10s loading time with a decent ADSL connection. Moreover, the description metadata is the same on all pages (based on "About Us" text), so that it is not possible to dedicate some of your website pages to a very specialized topic in order to rank well on search engines for a given set of keywords (long tail strategy). 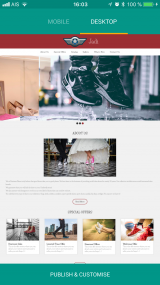 If you want to make your website yourself, you will probably get frustrated with Boomer because this app gives you very little control on the generated website. And if you do not want to make your website yourself, you'd rather ask someone else to take care of this task for you.